Miguel Marries Longtime Love Nazanin Mandi! Miguel and Nazanin Mandi are Married! 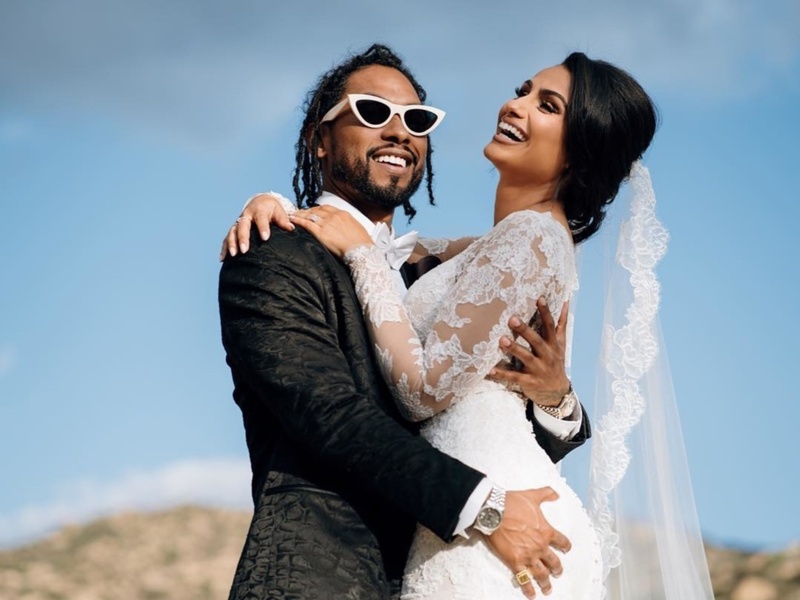 Congratulations are in order for R&B singer Miguel and his longtime love Nazanin Mandi, who married on Saturday, November 24, at the Hummingbird Nest Ranch in Simi Valley, California. The couple of 13 years managed to keep the wedding ceremony under wraps until they announced their nuptials to their social media audiences today. The bride wore a beautiful Monique Lhuillier gown with a Spanish-style mantilla veil, while the groom wore a custom tux by Van Van. The intimate wedding was coordinated by wedding planner, Myra Harbour, from Celebrate Flowers and Invitations, who helped the couple pick the venue for their ceremony. At the wedding reception, guests were treated to a dinner of traditional Mexican food by chef Eduardo Ruiz. The couple then stepped onto to the dance floor and grooved to their first dance to the Heatwave classic “Always and Forever”. With music from DJ Mick keeping the party live all night, they couple capped the evening by treating their guests to late night munchies by renting an In-N-Out Burger truck.